CALAMARI WRESTLER Director Returns With Japanese Superhero Spoof OUTERMAN! While we should probably wait to see the film before declaring any sort of comeback, we do at least feel comfortable delivering a healthy "Hello, stranger," to director Kawasaki Minoru who returns to the big screen this year with superhero spoof Outerman. For the uninitiated, Kawasaki is one of the great pranksters of Japanese cinema, a goofy talent that we first came across when his 2004 effort The Calamari Wrestler - which, yes, features an anthropomorphic squid training for a career as a professional wrestler - was on the festival circuit. We fell in love with Kawasaki's gonzo energy back then and there was LOTS of it to go around for a few years, with the helmer releasing a whopping fourteen features between 2004 and 2008 - including such goofy hits as Kani Goalkeeper, The Rug Cop, The World Sinks Except Japan, Executive Koala and Kabuto-o Beetle - after which he appears to have gone and taken an extended nap. 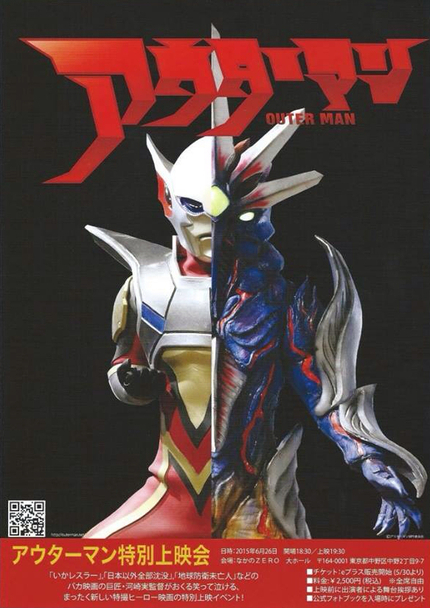 Kawasaki's pace of work has slowed considerably since 2009 but he's back on familiar territory with the upcoming Outerman, a new feature that - like much of Kawasaki's signature work - simultaneously embraces and spoofs classic Japanese pop culture, in this case the Ultraman school of superheroes. So if you want big goofy fun featuring larger than life heroes battling interstellar monsters on a tiny budget, check out the trailer below! I'm a huge fan of Kawasaki, even his lesser films are always interesting. I'm still waiting for Neko Ramen Taisho to hit DVD as it was very entertaining, and his Monster X Strikes Back Kaiju spoof with Takeshi Kitano is slight, but definitely understands the world that this tokusatsu film lives in.